Today we went back to Copenhagen to visit Tivoli Gardens theme park. The first ride we went on was the roller coaster with duckie (Dee from 1st Apsley) then the mine train with Vince and the star flyer – that was really fun but we were a bit scared before as it went up 80 metres in the air and spun round! 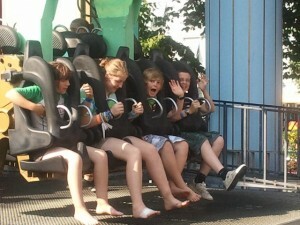 Sean felt a bit ill after we went on the ferris wheel, the flying trunk, nautilus as well as the golden tower. We were planning to go on The Demon but it broke down (Dee was glad about that because her head was spinning by then). Some pepole took forever to come back from the toilet and cut into our ride time we visited some side stalls and the bus needed fixing for home time – it sounded like a painful job but apparantly it will be OK for the 26hr bus and boat trip. We’re having a great time – tomorrow sounds really fun as we’re going to learn to carve things. Bye! Today we went to Copenhagen to see tourist attractions and try out some Danish food. We were not allowed to go to Mc Donalds!!. The weather was really warm! Patrick and Richards group went to a Danish cafe but the Explorers went to McDonalds. Dee and Vince’s group went to see the little Mermaid and it was little! All the groups went to the Danish Lego shop and the toy shop and bought lots of goodies. Richard’s and Patrick’s group went on a boat tour around the harbour. We had a smashing time seeing tourist sites instead of walking to each site. They also gave us a guided tour and some intresting facts. Once the boat had moored we had ten minutes to get back to the station and Patrick’s and Richard’s goup made it with seconds to spare! Then we found out we were on the wrong platform and we had to rush to platform eight. It was then back to the campsite where the site crew had done a bbq for everyone where the cooked 200kg of ribs. After a busy day everyone is really tired so were all off to bed now. 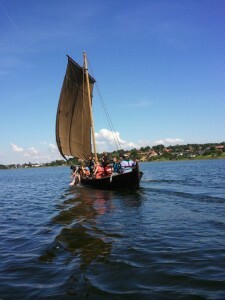 Today we set out to the Viking ship museum at 9:00 on an about a hour long journey which was quite boring. When we got there we waited to get our entry wristbands, then we split into our groups and went into the main museum. We watched a film about the reconstuction of a big boat and its joureny from demark to dublin and back, then we looked at the recovered parts of ancient viking long ships. Some people dressed up in Viking gear for a photo but we didn’t because it would have looked a bit embarrissing! We then went up to the shop and bought lots of souveniers. After that we went to have lunch which we packed ourselves and whilst the slow people finished we gathered and played cards. Once everyone had finished lunch we went over to the place to row and sail the Viking boats. Matt Armstrong was the only one on our boat to weigh under 50kg so he had to wear a big, orange lifejacket which looked weird amongst the rest of our small black ones. After a bit of getting used to rowing, we put the sail up to let the wind slice us through the waves. Then a few of us put our feet in the water and some held a very slimy, jelly-y jellyfish! Afterwards we had a race back to the harbour but some people found it hard to keep in time with one another, so we came 3rd place out of 4. 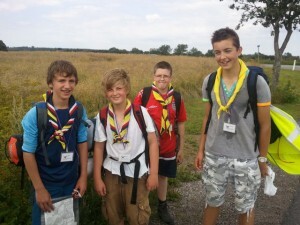 As it was extremly hot the leaders bought us all an ice cream!! We then went back home and had a few hours of free time before dinner of beef stew and dumplings. And here we our now, writing todays blog at 20:21 which we have finished now, so log off!! 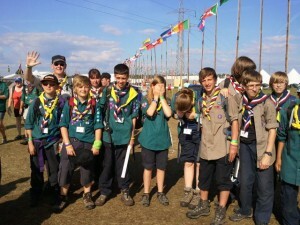 Today we visited the Scout Jamboree in Sweden where we arrived at 10:30am after a 3hr journey. We waited in suspence as the thick fog lifted to reveal the wonderous enterance to the Sweedish Jamboree. 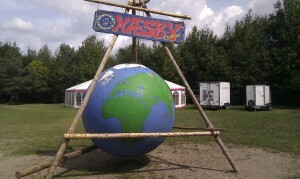 We followed the long line of the worlds’ flags on a journey to the Jamboree shop. Inside we found so many amazing items that we could purchase for shockingly bad prices. We also were able to swap badges with people from all over the world and we were glad that they were happy to accept our offerings. We came away with scarfs, badges, hats, sunglasses and many other items. Today we got back from our 2 day hike. We stayed in bivoac’s which are made from tarpauline tent pegs and some guide ropes. As soon as we arrived we set up our bivoac’s. For dinner we had Wayfarer meals – these are easy to cook, boil in the bag meal that taste excellent. The hike back was easy as it wasn’t as long as yesterday and we enjoyed the views across the lake and countryside. When we got back to camp we ate some biscuits and had lunch. For lunch we had vegtable soup with some bread and then some fruit. For dinner tonight we are having sweet and sour pork that will be cooked on the alter fires. 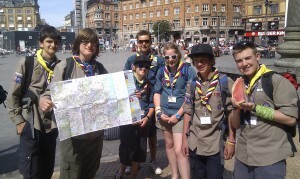 Tomorrow we are off early to Sweden for the 22nd world scout Jamboree which should be a truly amazing experincence. I also met some Danish ladies. The weather has been very hot all day and it is very much shorts and sandals weather. Love Luke O, Sean K and Oliver ‘Orville’ P.
We all had a well deserved lay-in this morning [Saturday] and woke up to beautiful sunshine. Saturday was hike day so we spent the morning getting ready and learning how to build our shelters. Once everyone had been coated in suncream we set off into the Danish countryside loaded with sleeping bags, food and everything we needed to build our shelter. The weather today has been fantastic with boiling hot sunshine all day. 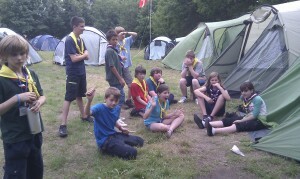 All the Scouts made it to the overnight stop and setup camp for the evening. They are currently cooking their boil in a bag dinners and looking forward to a night out in the open, don’t worry they have 2 leaders keeping an eye on them all night…. We’ve also just been told that the campsite are planning a first aid incident challenge where apparently during Wednesday night about 1am-ish something is going to happen on site that will mean everyone on site has to get up and deal with the emergency – Richard isn’t impressed that they are going to get all the kids out of bed! We started our adventure as we stepped on the ferry. This adventurous journey took ages as the ferry was dangerously slow! (as we could have died of boredom). As the kids set of to explore we sat down and relaxed. Lorna,Vince, and Dee’s group all stayed together on the massageing chairs. We got on the ferry at 9:30 and got of at 4:30 Danish time (one hour ahead). Eventually we got here and started exploring straight away – some of the Explorer Scouts tried to make a house and failed when it fell down so we decided to tie someone legs together… they then tied my hands and feet together! Afterwards we decided to go in the woods and climb a tree! We are now cooking dinner and looking forward to an early night. So far Its been fun!!!!!!! !